Israel has deployed additional military forces to the Gaza border in preparation for planned protests today as part of the Great March of Return. The military expects some 50,000 protesters to gather at the border fence as a continuation of the demonstrations which started on Palestine Land Day last week. 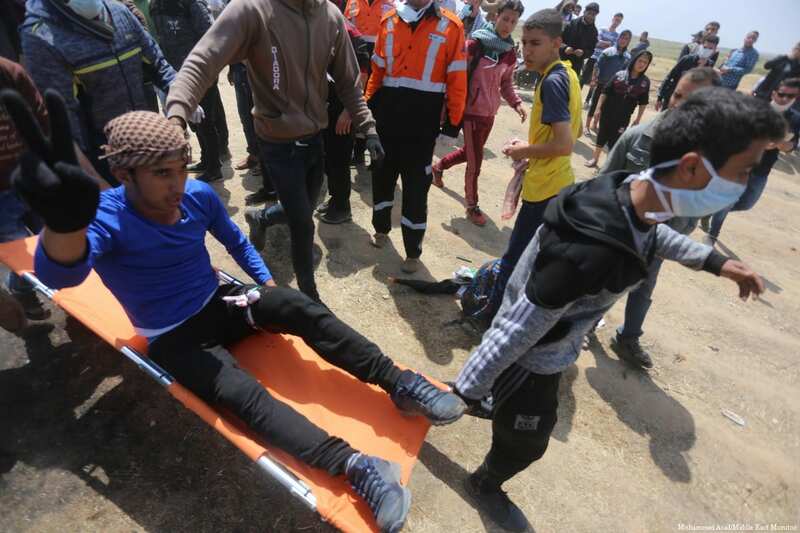 Some 16 Gazans were shot by Israeli forces on the first day of the protests, with the death toll rising to 20 over the past week. Protesters are calling for the right of return for Palestinian refugees and their descendants, to what is now Israel. 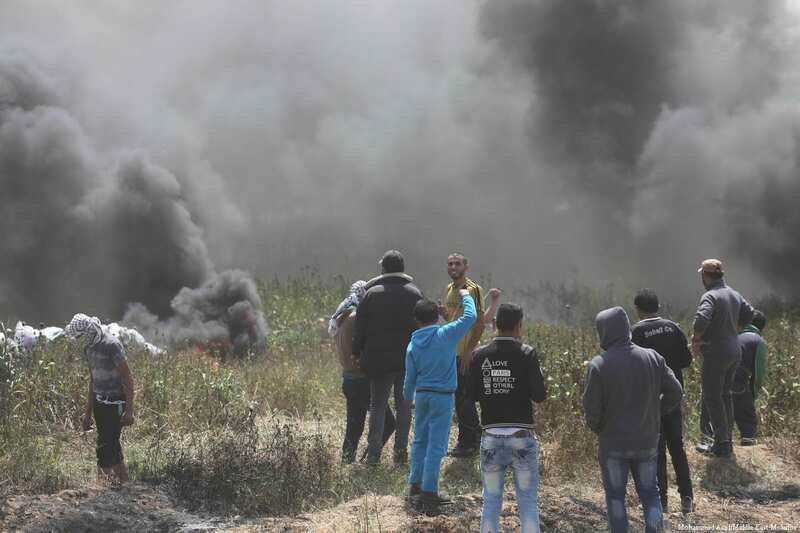 Gazans have been bringing tents thousands of tyres to burn since yesterday, in what has become known as “The Friday of Tyres.” They say they intend to use mirrors and laser pointers to prevent Israeli sharpshooters from targeting them. Israel’s rules of engagement during the demonstrations are to remain unchanged, meaning that snipers will be permitted to shoot at anyone on who approaches the Gaza side of the fence. Human rights organizations in the country and international groups have criticized this protocol, which they say led to the unjustified killing of unarmed Palestinians. Israeli rights group B’Tselem, has appealed to Israeli soldiers to refuse any “grossly illegal” orders to fire at unarmed protesters. Hospitals in Gaza have reportedly been forced to discharge seriously ill patients in an effort to clear beds, as they anticipate having to admit dozens of injured protesters later today. 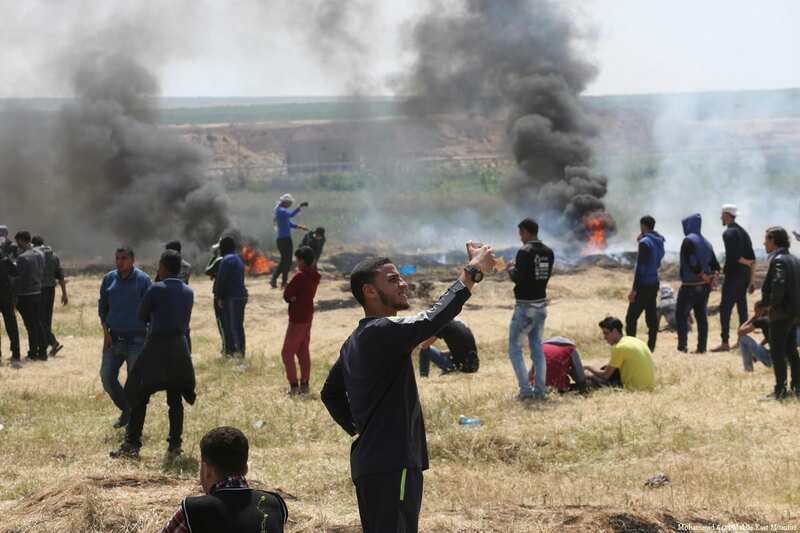 Whilst according to Palestinians, the majority of demonstrators have been at least 100 metres away from the fence and were unarmed, Israel has accused the protest of being organised by Hamas. The Israel Foreign Ministry further stressed its position on Twitter yesterday, in a series of tweets addressing foreign journalists, in which the ministry attempts to convince media outlets that Hamas is using the protests to target the Israeli border. If you are planning on covering and/or addressing events at the Gaza-Israel fence on Friday April 6, we urge you to take the time to read the following. The US has also directed its criticism at Palestinian leaders. 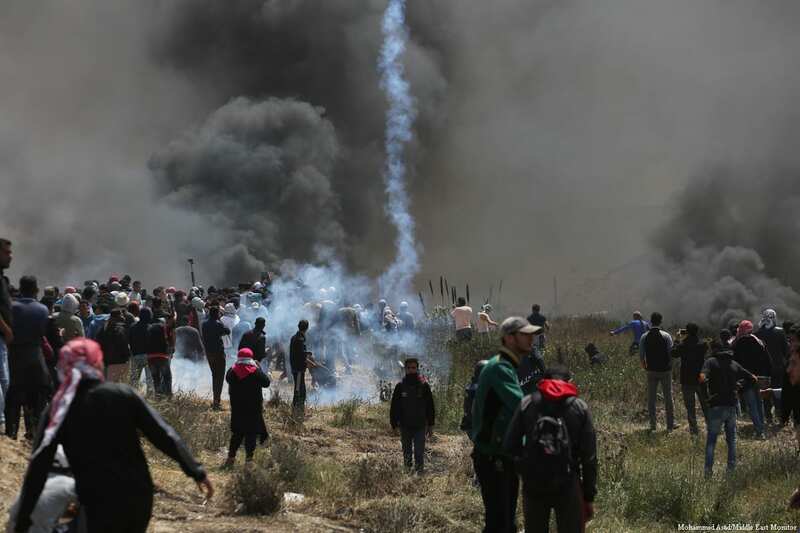 “We condemn leaders and protestors who call for violence or who send protestors – including children – to the fence, knowing that they may be injured or killed,” President Donald Trump’s Middle East envoy, Jason Greenblatt, said in a statement yesterday. Chief of UNICEF Gaza Field Office Tania McBride has said less than 4 per cent of Gaza’s ground water is usable. During a ceremony held yesterday to mark World Water Day McBride highlighted the dangers of water pollution and pumping wastewater into the sea, particularly for Palestinian children. She reiterated that UNICEF works with several local and international partner institutions to reduce water damage and provide safe drinking water in the enclave. Manager of the Islamic Relief Community Development Programme, Hossam Jouda, said his agency has been collaborating with the local community to provide safe drinking water, pointing to the importance of raising awareness. Deputy Chairman of the Water Authority, Mr. Ribhi Al-Sheikh, highlighted the Water Authority’s efforts to secure access to clean water. Around 90 per cent of Palestinian water resources are under Israeli control. He stressed on the need for necessary funding and implement development programmes for the water system. The Palestinian Central Bureau of Statistics has said that children constitute 45.3 per cent of the Palestinian population, 43.4 per cent in the West Bank and 48 per cent in the Gaza Strip. “According to the final results of the Population, Housing and Establishment Census 2017, the number of children reached 2,115,370 in the State of Palestine,” the bureau said in a report to mark Palestinian Children’s Day. According to the report, Israeli armed forces arrested 6,742 Palestinians in the West Bank and Gaza Strip in 2017, including 1,467 children under 18; 350 of them are still in detention. As many as 15 Palestinian children were killed in 2017, including one child in the age group 9-12 years, three children in the age group 13-15 years and 11 children in the age group 16-17 years old while six children were killed in the first two months of 2018. 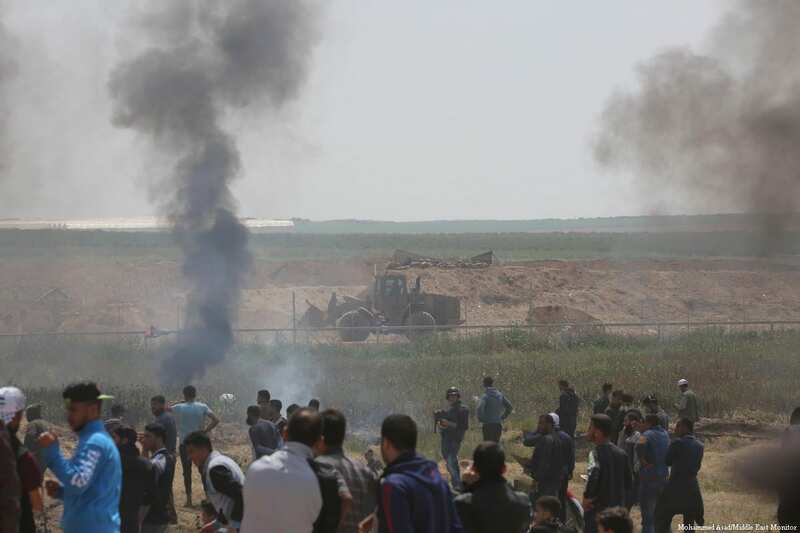 At least two people have been killed and dozens more have been injured as Israeli forces respond with violence to protests taking place today at the Gaza-Israel border. 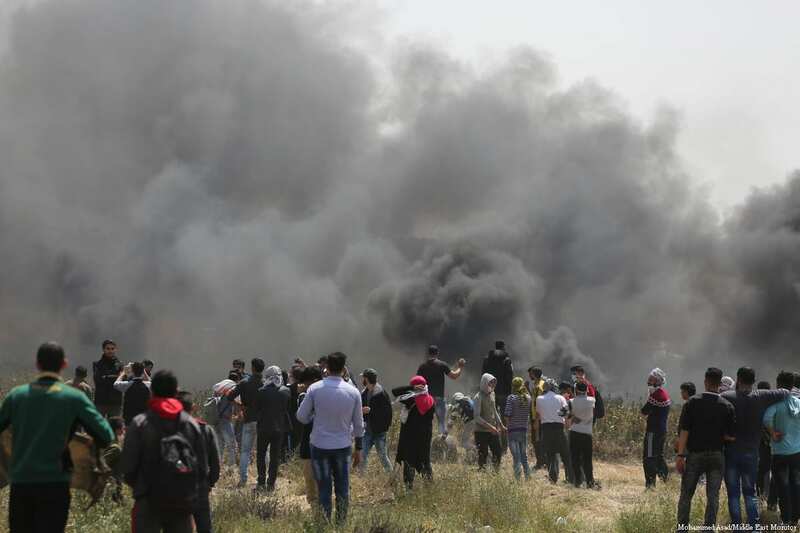 The Palestinian Red Crescent has confirmed that some 250 people have been injured, over 100 with live fire, with seven suffering from critical injuries as a result. 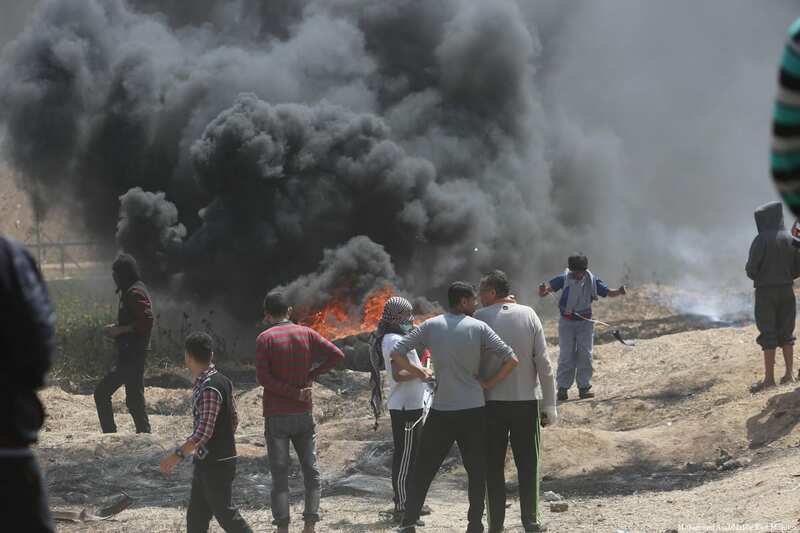 The death toll since last Friday currently stands at 24, after 38-year-old Osama Khamis Qdeih and 38-year-old Majdi Ramadan Shabat died in the east of the Strip, according to the Gaza Health Ministry. Earlier today, Thaer Rab’a succumbed to his wounds after being shot by Israeli forces on 30 March. Tear gas has also been fired at protesters, with some 45 people being transferred to hospital suffering from asphyxiation. Reports from the ground indicate that Israeli forces have also been targeting medics attempting to treat the wounded, choking them with tear gas. Israeli forces are also quashing solidarity protests in the West Bank. Tear gas was fired at protesters in Hebron according to the Palestinian Wafa news agency, and at least three people were detained in Bethelehem, including one child. Wafa also reported that demonstrations were taking place in the villages of Beita and Kafr Qaddum in the Nablus area. Israel has deployed additional military forces to the Gaza border in preparation for planned protests today as part of the Great March of Return. Demonstrators are calling for the right of return for Palestinian refugees and their descendants, to what is now Israel. According to the Israeli Defence Ministry, the rules of engagement during the demonstrations are to remain unchanged, meaning that snipers will be permitted to shoot at anyone who approaches the Gaza side of the fence. Human rights organisations in the country and international groups have criticised this protocol, which they say led to the unjustified killing of unarmed Palestinians. Israeli rights group B’Tselem, has appealed to Israeli soldiers to refuse any “grossly illegal” orders to fire at unarmed protesters. In 1994, Baruch Goldstein, an Israeli-American Jewish settler, gunned down 29 Palestinian Muslims as they prayed. Israel on Friday prohibited the Azan (the Muslim call to prayer) at the Ibrahimi Mosque in the West Bank city of Hebron (Al-Khalil), according to Palestinian Religious Endowments Minister Yousef Adais. In a press statement, Adais described the move as “a dangerous precedent” and “a cowardly breach of the freedom of worship”. “Continued Israeli violations against the mosque clearly show that the occupation authorities, along with the [Jewish] settlers, are trying to exert total control over the area’s Muslim holy sites,” the minister asserted. In 1994, Baruch Goldstein, an Israeli-American Jewish settler, gunned down 29 Palestinian Muslims as they prayed at the mosque before being killed himself. Since then, the mosque — believed to have been built on the tomb of Prophet Ibrahim — has been divided into a Muslim section (45 per cent) and a Jewish section (55 per cent). The Ibrahimi Mosque is located in Hebron’s Old City district, where some 400 Jewish settlers now reside under the protection of about 1,500 Israeli soldiers. A Palestinian video journalist and photographer who had just been contracted to work with MEMO has been hospitalised after being shot by Israeli sniper fire today while covering The Great March of Return near Gaza’s eastern border. Though wearing a vest marked ‘PRESS’, Yaser Murtaja, co-founder of Ain Media production company, was shot in the abdomen by Israeli snipers perched on a hilltop on Gaza’s border. Israeli sniper shoots journalist on #Gaza border and now he is in the operation room in hospital. Ain Media, which is made up of a dozen Palestinian media professionals, has been covering the events taking place near Gaza’s border with Israel since Friday. In the past, the team have produced work for Al Jazeera Documentaries, BBC Arabic, VICE, Alaraby TV, UNICEF, UNRWA and Oxfam amongst others. In an interview with MEMO earlier this month, Yaser said that his passion for filming and photography was born out of his desire to document the events taking place in the besieged Gaza Strip and to do what he could to help shed light on the reality of life in Gaza and the plight of fellow countrymen under occupation and blockade. At least 23 Palestinians have been killed by Israeli forces in Gaza and more than 1,500 others wounded during the Great March of Return, a six-week demonstration and sit-in which started last Friday to mark Palestine Land Day and is calling for the implementation of the Right of Return. Demonstrators are demanding that Palestinian refugees be granted their right to return to their towns and villages in historical Palestine, from which they were driven in 1948 to make way for the state of Israel. In the run-up to the mass demonstrations last week Israel deployed thousands of troops on the border, threatening to use live ammunition against anyone who threatened Israel’s “security infrastructure”.